I want to thank all of you who have visited our web site. I have been asked a few times in the past why I started The Mitzvah Project. Let me first say how much I will miss Rabbi Klepfisz who was nice enough to be our official Rabbi for the last three years of his life. He was a great and extremely humble man, someone who lived the Torah in every way. We are now looking for some new Rabbi’s to help us to take up where he left off. My personal feeling is that he is in Heaven looking down at us, encouraging us to continue our efforts to achieve World Peace. He would always help me whenever I would call him. His sincere desire was for us to do our best to settle the Land of Israel according to the Torah and truly fulfill all 613 Mitzvot. I grew up in Miami, Florida in a home that was not very religious. We celebrated Passover as children, and it was always fun to light the Chanukah candles. My brother and I were not bar mitzvahed at 13, even though both of my parents were born Jewish. I don’t think that I ever went to services with my parents, and if I did it was for someone else’s bar or bat mitzvah. When I was in my thirties I did go to services for Rosh Hashanah and Yom Kippur for a few years with a friend of mine and his family. Those of us who could attend Passover seders at my aunt and uncles house usually did. I was 37 years old when I was first called to the Torah at the Young Israel of Kendall synagogue in Miami quite unexpectedly. The Rabbi had to recite the blessings of the Torah for me to repeat because I could not even read the transliteration. After the next aliyah was over I took my seat only to find that I had just been bar mitzvahed! It was explained to me that during times of war in the old days, many times the rabbi would set up a specific time for the young bar mitzvah boys to congregate. They would be called to the Torah for an aliyah, and that was the major part of their bar mitzvah. There was not enough time for a big party or a separate celebration for each child. When I returned home I joined the local synagogue, and later became the president of it. I started reading the Artscroll siddur and began to attend services regularly. We organized a group to learn how to read Hebrew with books from the National Jewish Outreach Program. Rabbi Ephriam Buchwald does a wonderful job with these programs. We studied the Hebrew Reading Crash Course, and it was very helpful to say the least. They have a web site at www.NJOP.org. I also took the Discovery Seminar, which at that time was presented by Aish HaTorah. This was one of the best programs that I have ever seen. it was sponsored by the Jewish Federation of Volusia and Flagler Counties. The Torah is proven to be the word of God, and the Discovery Seminar explains many different ways that we know it is. When I learned about this I began to investigate it for myself. I began to read the Artscroll Stone Edition Chumash every night before I went to sleep. I would sit up in bed and read from about 11 until 12. It took me about one year to finish it. Frankly I felt that some of the stories were so far fetched that it was almost impossible to believe. “The Midrash Says” series of books are really great because they explain what really happened in detail. If you haven’t read the Midrash then you are only scratching the surface of the Torah’s real meaning. I remember when I was young I asked if the stories in the Bible were true, or if they were just stories. Some of the children at the bar mitzvah I had been to were telling me that they were all true. I thought that they were just stories. When I found out that the stories are all true I could not believe it. I had to go to Israel and see this for myself. I have been there twice and I stayed for a month each time. I think that I saw enough to be able to tell what is going on over there. The point is that the Torah is true, and we should all be following it. I had heard that there are 613 Mitzvot contained in the Torah. 365 of these we are supposed to stay away from, and 248 of them have to be performed in some way, shape, or form. It is very difficult to be able to tell where all 613 of them are to be found in the written Torah. It also requires the Oral Torah to be able to know how to properly do many of them. There are other times when the use of talmudic reasoning is necessary to be able to tell when something should be done or not in specific instances. The average person is unable to do this. I asked about this situation and was shown a book by Maimonides called the “Sefer HaMitzvot.” It usually comes in two separate books, one for the positive mitzvahs and one for the negative mitzvahs. The list that I have provided on this web site is taken directly from those books. I made the list in 1998 and distributed it to whoever wanted a copy for free. I felt that it was important for me to do what I could to help other people learn about the 613 Mitzvot. Originally I started The Mitzvah Project for the purpose of building The Third Temple. The issue of building the Third Temple is important, however Jewish education is important also. I figured that if I could educate the Jewish community about the importance of the Third Temple it would make things easier for it to be built. We also strive to achieve World Peace, however difficult it might seem. I paid an attorney to handle the paperwork in order to form this corporation and register us with the State of Florida. I also thought that I could make a big impact on our local community here in Florida with The Mitzvah Project. At this time I don’t think that it has had much of a positive effect. We have not been too successful in encouraging them to be more observant regarding the 613 Mitzvot, although things are improving every day. Some people are very stubborn and unwilling to open their eyes to what is clearly the truth. The Pirkei Avot explains that someone who can teach and refuses to do so deserves death. I pay for all of the expenses to continue our work here on the internet, and I am happy to do it. I encourage those who can afford to donate money to do so. Of course if you have needy family members then they come first. Some Jews refuse to accept the 613 Mitzvot. Many of them know that they are true, yet they are unwilling to change their lives. It would be better if they would just admit that there are 613 Mitzvot, and that they are sorry that they are unable to fulfill them at this time. It is always better to admit that you are wrong and say that you are sorry to HaShem. He will accept your teshuvah if you are honest with Him. It is a mitzvah to reprove your fellow Jew, even if you are unable to do any better yourself. If you really care about the health and well being of another person, whether they are your family, friend, or just another stranger, you will do whatever you think is right to help them. It is usually best to explain something to someone in small pieces so to speak, than all at once. It is very important to speak to them privately, so as not to embarrass them in public. I don’t want to be punished for something that we as a community are doing wrong because I don’t say anything. It is my obligation as an observant Jew to speak up when I think that there is something wrong. Even if I don’t think that it will help, it is better for me to do something if I can. Another reason why we do this is because of the drastic rate of Jewish intermarriage and assimilation. The UJC spent six million dollars on a survey about this issue and the results are not very good. My figures from the State of Israel say that 70% of American Jewish women and 80% of American Jewish men will not marry another Jew. The figures for assimilation are most likely even higher. I know because I was pretty much assimilated, and so were my Jewish friends. Many rabbi’s have been letting this go on for many years now. They are aware of it, and choose to do very little about it. Perhaps things are getting a little bit better due to the increased attention that the State of Israel has been getting lately. Some Jews are returning to their roots, and if I can help some of them do so I am happy to help out. If you think that I am wrong about this just go to a Reform or Conservative shul and look around. Most of the people are older folks who have been going to services for years. Once the children get their bar and bat mitzvahs they rarely ever go back. I enjoy services at Reform and Conservative synagogues, and I don’t want to say anything negative about them. I have learned a lot at these synagogues, and there are many very good ones. You should go to services often, at whatever synagogue you feel comfortable in. This does not mean that you shouldn’t learn the Torah and observe the mitzvot on your own as well. Just do the best you can, and look to do more mitzvahs as much as possible. It takes time to become observant, and the rewards are too great to pass up. I know that my life would have been much better if I would have learned the Torah at an early age. Even if we only reach a few Jews and can help them to better themselves I think we have been successful. Every now and then I get an e-mail from someone about our site. I received a note from a lady doctor once who thanked me for helping her son to learn more about Judaism. He was getting ready for his bar mitzvah and his mom wanted to learn more about being a Jew than he was being taught at his synagogue. She took her children regularly to services at the local Reform synagogue when they live, however most of the other children did not go. Her letter was beautiful, and it only goes to show that I am not the only one who is aware of the decline in Jewish education and Torah knowledge. It would be great if the Jewish community would come together. We have become a scattered group of synagogues, organizations, and mostly uninterested Jews. There is really only a very small group of people who are doing anything productive to help the Jewish People. The present road map to peace is merely a way for the Saudis to continue holding the rest of the world hostage to their oil reserves. In order to pacify them we allow Israel and the Jewish people living there to be cut into pieces. It will not work because HaShem does not want it to. There will never be a “palestinian state” inside the borders of Israel. Those people do not belong in Israel, and the best solution is to ask them to leave. They will be much better off somewhere else in the Arab world where they can have a productive life with their brethren. The terrorists who refuse to leave will be apprehended and brought to justice one way or another. This is the real Tikkun Olam, not some rhetoric about social justice that is basically meaningless. Tikkun Olam means rectifying the world by observing the 613 Mitzvot. It is a very important mitzvah to settle the land of Israel according to the borders given in the book of Numbers chapter 34. Please do not be fooled by the lies of some of our leaders. We went to Iraq to get rid of Saddam Hussein and get control of the oil there so that we don’t have to rely on OPEC so much. We also cannot allow mostly innocent people to suffer at the hands of these cruel dictators. It is far too dangerous to allow anyone with so much money to obtain nuclear, chemical, or biological weapons that could, God forbid, use them against us or any other country. We have to get rid of all terrorists as fast as possible. The way to World Peace sometimes involves going to war. There are many mitzvahs involving warfare and how and when it should be undertaken. It is necessary sometimes to remove an enemy before they strike, especially if is only a matter of time until they do. The Torah tells us that Jacob/Israel and Esau/Edom can never live together peacefully. One of them always has to be above the other, and it is a rule that can not be changed. The Arabs live a different kind of life than the Jews, and they will always hate us. 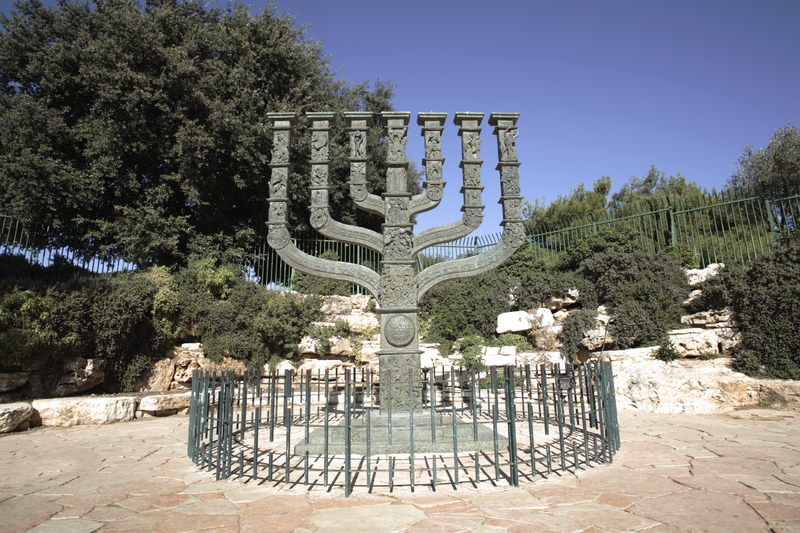 It is a situation that HaShem has created, and it is well documented in history. They should stay within their own borders, and we will stay on ours. That is the way that peace will be achieved in the Middle East regardless of what you hear on TV or read in the news. The eastern border of Israel is along the Jordan River. We have a saying here in this country, “Love it or Leave it.” The same thing applies in Israel. The sooner the Arabs who don’t love Israel leave, the better. I want to add one of the most important things to my message. The book of Numbers has a passage in chapter 33 verses 55 and 56. It says “But if you do not drive out the inhabitants of the Land before you, those of them that you leave will be pins in your eyes and thorns in your sides, and they will harass you upon the Land in which you dwell. And it shall be that what I had meant to do to them, I shall do to you. The Torah then gives the borders of Eretz Yisrael. What does this mean? It means that the rabbi’s have not properly done their jobs. This applies to every single one of them. Yes I am being harsh. This is because HaShem does not want non-Jews living in Israel. The only way that a non-Jew is allowed to live in Israel is if they agree to be a gair toshav, which means resident alien. They are expected to accept and live by a minimum of the Seven Laws of Noah and be subservient to the Jewish People. They are not to be granted full citizenship and are not given all the rights and responsibilities of a Jew. Only HaShem can make these demands on a people and a country. It seems harsh to us as human beings. If you look at the history of Israel and the Jewish People you will see that His wisdom is correct. When the Jewish People obeyed His wishes properly there was peace in Israel. When they did not we were persecuted and ultimately expelled. It is up to us to follow His decrees and do what is right. There is an old saying that if you are kind to the cruel, eventually you will be cruel to the kind. It is obvious that the so-called “palestinians” do not want peace with the Jews. They are continuing to teach their children to hate and kill Jews. They have programs for children similar to Sesame Street that teach the young children to grow up and kill Jews. This is unacceptable. I suggest that the money given to them is used to relocate them to another country. Dubai, Kuwait, Qatar, the UAE, and many other countries are very wealthy and can accept these people easily. This is the proper way to help them to have a better life. Each person can receive enough money so that they can start a new life with a better education, a better job, and a better place to live. It is obvious that the United Nations is biased against Israel. They have not lifted a finger to stop the destruction in Syria. It is a travesty to attempt to prosecute Israel for defending itself against a murderous group of terrorists like Hamas, Hezbollah, Islamic Jihad, Al Qaeda, and others. I am sorry that our “leaders” have not taken the proper stand against this evil. It is up to us to do what is right. I hope that you will support me in doing what is right and telling the truth. Thank you for reading this. May HaShem continue to bless you and your family and friends at all times.